I talked to a LOT of people. Book Expo America (known as BEA) is a convention for booksellers. Publishers have booths, and booksellers, librarians, teachers, authors, illustrators, bloggers, agents, and others wander between them and talk about books. In a word, it is AWESOME. In actuality, my BEA Adventure lasted almost a week. Monday night was a party at Books of Wonder. Tuesday night was the Association of Booksellers for Children "not-a-dinner" event. Wednesday was... actually, Wednesday felt like three days. It started with the Children's Authors Breakfast, it continued with exploring the exhibit floor, and it ended with 3 different parties around Manhattan. Thursday included a meeting with my agent, more prowling through the exhibit hall and talking to people, and then the long schlep home with three bags stuffed with books. I also brought home a quote from Richard Peck's speech at the Wednesday breakfast: "The only way to write is by the light of the bridges burning behind you." From the context of the speech, he didn't mean burning bridges in the sense of alienating people. (That's never a good idea, IMHO.) He meant it in the sense of making career choices. If you want to be a writer, you have to choose NOT to be a lot of other things. You have to burn the bridge that could lead you to a life as a... I don't know.... insert other career goal here. On one hand, I think that statement is less true about being a writer than being, say, a neurosurgeon or an astronaut. You can have a day job and be a writer. You can also have one career and then become a writer as a second career, or vice versa. But on the other hand... Everyone has twenty-four hours a day, and every time you choose how to spend those hours, you are also choosing how NOT to spend them. For me, the writer bridge is the only one that I ever wanted to cross. And I'm happy for the light of the other burning bridges -- it keeps me from tripping over my feet as I walk across. But I'm curious what you guys think of that quote. Do you think it's true? I think you explained that quote wounderful. I write becuse i have no other job and plus, its all i've ever wanted to do. I think it's true of every profession. I think it needs to be said of writing because our culture behaves as if it's easy, fun, and takes no time commitments - and is, therefore, valueless. Look at the characters on TV who are supposed to be writers. Do you ever see any of them BIC, writing or researching markets or hustling for assignments? How many times have you been scolded for wanting respect and/or remuneration for your work, as if you're supposed to be grateful that somebody else ever reads you at all? How many of us feel guilty for devoting time to writing in preference to family obligations, housework, or a "real job?" How many wannabes do you meet who are looking for the Magic Bullet that will let them write for publication without working at it, the secret formula for success? Commitment is the only way to succeed (and it doesn't guarantee anything). It seems obvious, but almost every career has a moment of realization, when we face up to that and decide to knuckle down and work at This Thing rather than The Other Thing. I think that it makes perfect sense for any profession...I have wanted to be a million things since i was little. A doctor, a mad scientist, a professional ice cream taster...the list goes on and on. But there are only two things i want to do now, teach and write. I discovered that I don't deal well with sick people, science and i will never mix well, and the ice cream tasting thing is better left as a hobby. So, as we go along, we burn a lot of the bridges as we discover that they don't fit. Laura: I like the idea of a unicorn at the end of the bridge! Peni: I remember actually arguing with the TV while watching Coyote Ugly for its portrayal of songwriting. Whole plot hinges on the idea that anyone can be a successful songwriter if only they conquer their stage fright. I'm not a songwriter, but seems to me that deciding to commit is just step one. As you said, it takes real knuckling down, and there's no Magic Bullet. 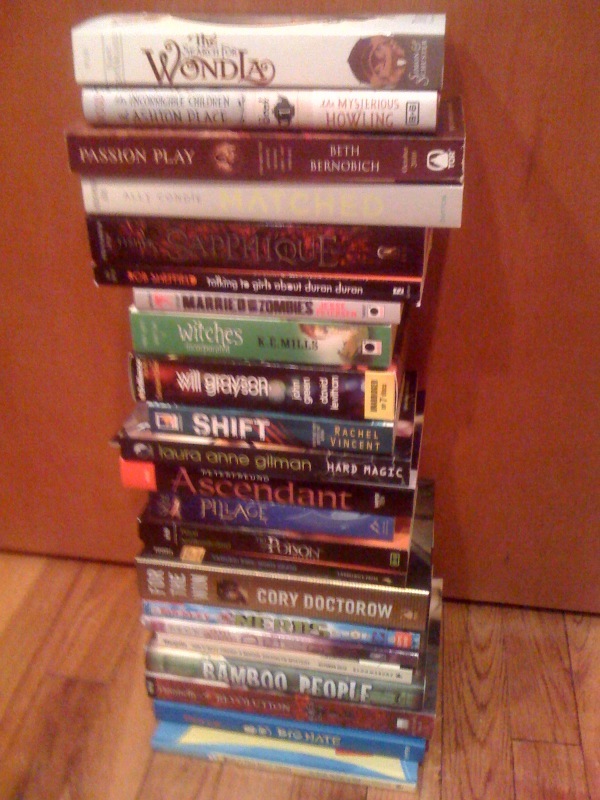 Phebe: My to-be-read stack just grew a LOT! I have 12 unicorns and a pegasus at the end of my bridge. in your stack of books i noticed " pillage" by O. Skye, and i just wanted to shout out that i LOVE that book. and so does my brother. for me, i have to agree with you on how you on't have to burn all the bridges. i've taken an interest in library sciences, although my goal is to be a writer. Cover Art for ENCHANTED IVY!! !